Having spent the first quarter of the year reviewing the state of his company, Ericsson CEO Börje Ekholm has now unveiled his grand plan to turn the super-tanker around. The Vestberg era was defined by a drive to diversify away from the core network hardware business, which has been in slow decline for Ericsson. The areas of diversification were generally illustrated in one of Vestberg’s favourite slides below. 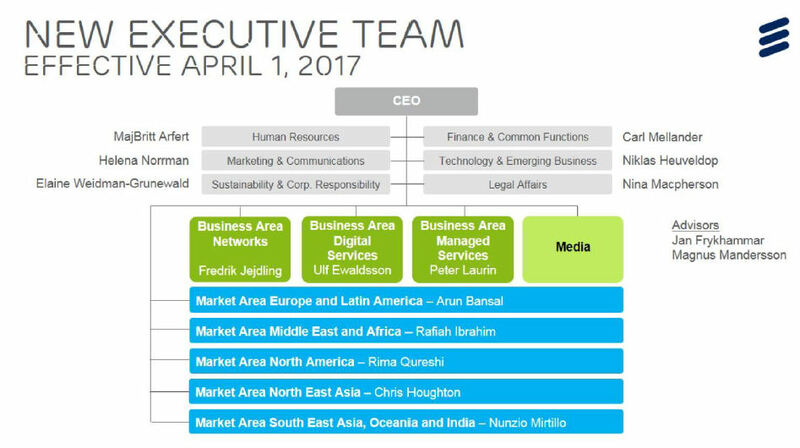 Ekholm has decided Ericsson got carried away with its efforts to diversify and spread itself too thin. Not only have a lot of those new areas of business failed to deliver the required growth or profitability after several years of trying, they also have the potential to distract the rest of Ericsson such that it stops even doing its core networks stuff well. The sensible solution, and generally the most common one when corporations reach the kind of moment of truth Ericsson has, is to jettison the stuff that’s furthest away from your core competency, reinvest in what’s left, and review new business priorities. In the case of Ericsson this looks like a disposal of the media and cloud hardware business, a refocus on networking services and betting on IoT as the main source of long-term growth. Ekholm didn’t specifically say he wanted to offload the media and cloud hardware businesses, but he did say Ericsson was ‘exploring strategy opportunities’ for those units, which is generally accepted as a euphemism for flogging them. Furthermore the recent change in Ericsson’s reporting structure always looked designed to facilitate this process and anyone connected to those units has been removed from the executive leadership team. Sund’s demotion is also intriguing as industry and society was positioned at Ericsson’s big IoT play a couple of years ago. That apparently hasn’t gone according to plan and, for all the talk about skating to where the IoT puck is going to be, Ekholm has decided not to maintain a distinct IoT business unit. This is probably sensible as IoT is still so ill-defined and diverse it’s probably better to ask all the other units to keep an eye out for IoT opportunities. 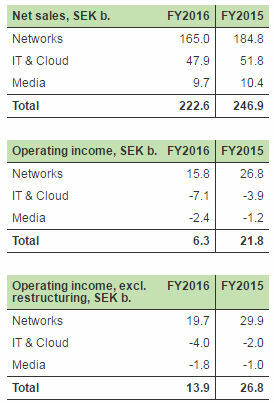 All this reshuffling will incur yet more restructuring costs for Ericsson. It’s going to write down the value of assets, much of which will be from the Media and IT & Cloud reporting segments, we have been advised, to the tune of SEK 3-4 billion. There will be restructuring charges of SEK 6-8 billion and separately there will be SEK 7-9 billion of provisions related to certain large customer projects that Ericsson didn’t want to detail. “With these changes I am confident that we will create the most intelligent and efficient networks, deliver the most competitive solutions and constantly innovate to enable our customers to succeed in a fully connected world,” said Ekholm. “While we will continue our work to take out cost at high pace with targets surpassing current ambitions, we will not guide on cost levels going forward as it is an isolated part of the profit and loss statement. With the actions announced today, and assuming stable market conditions, we foresee significant improvements already in 2018. 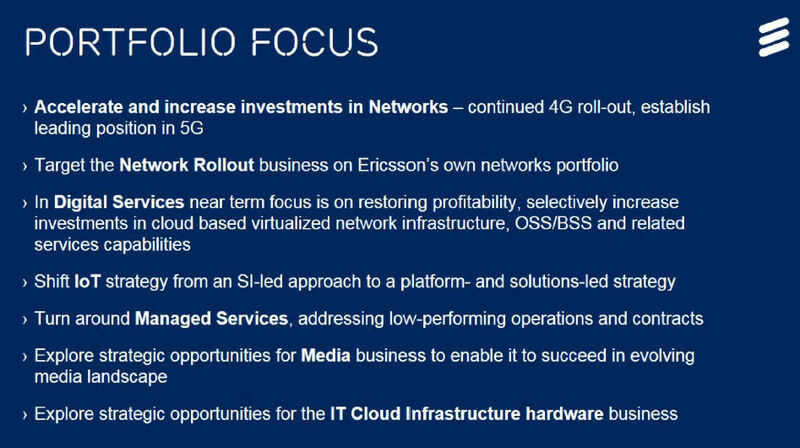 You can watch Ekholm summarising all this stuff in the video below, and below that a couple of slides from Ericsson’s presentation on the new plan. Essentially Ekholm seems to be drawing a line under the Vestberg era, deciding not to throw good money after bad and shrinking the company to a level where profitability is no longer a concern, which is sensible. What is less clear from this new plan is where growth is going to come from. Not media and cloud hardware, that’s for sure, but services and IoT are very broad target areas, with a hell of a lot of competition. Intriguingly there was little mention of 5G. 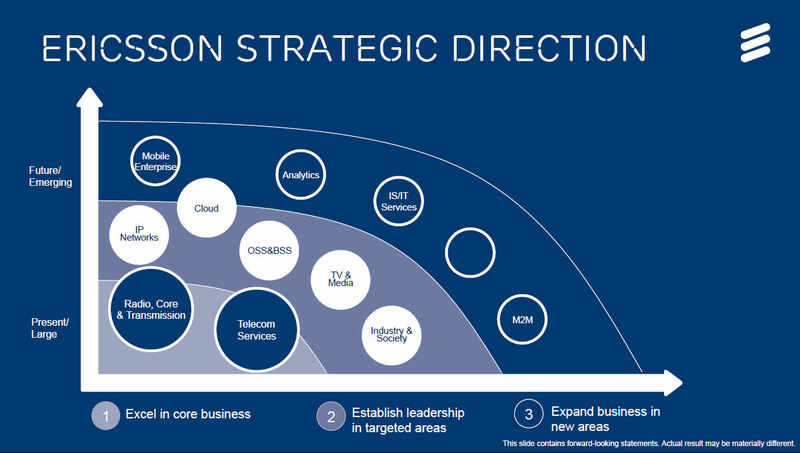 This looks like a solid first step but over the course of this year we will need to hear more about how Ericsson is going to exploit the networks services and IoT opportunities if we’re to start getting optimistic about its long term prospects.